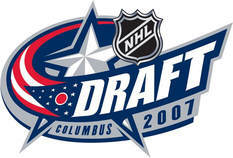 The 2003 NHL Entry Draft was held on Saturday, June 21, 2003 (1st round) and Sunday, June 22, 2002 (2nd to 7th rounds) at the United Center, home of the Chicago Blackhawks. The New Jersey Devils won the draft lottery with Philadelphia and Dallas winning the second and third picks, respectively. The expansion Vegas Golden Knights won the lottery's sixth slot and chose sixth overall in the first round and third in each subsequent round. New Jersey selected center Nico Hischier from Halifax (QMJHL) with the first overall pick.